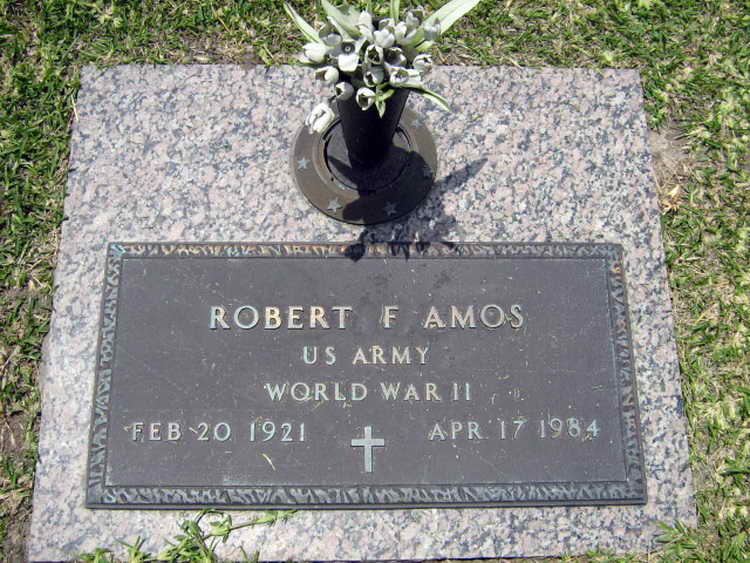 Grave marker for Robert F. Amos in the Consolata Cemetery, Lake Charles (Calcasieu Parish), Louisiana. Robert enlisted in the Army in Los Angeles, CA on 28 November 1942. Pvt Amos initially served with the 509th Parachute Infantry Battalion as a light mortar crewman. He was awarded the Combat Infantryman Badge for action in either Italy or southern France. After the ranks of the 509th were so severely reduced in the battle of St. Vith, Belgium, he was one of the remaining men. He was transferred to the Hq 1st, 508th in February 1945.